Coal is America’s most abundant energy resource—making up 90 percent of U.S. fossil energy reserves on a Btu basis. At current consumption rates, the U.S. has more than 250 years of remaining coal reserves. America’s coal industry is doing its part to increase U.S. competitiveness abroad while producing jobs and economic benefits at home. Coal is essential to the U.S. economy, providing affordable electricity to households, businesses, manufacturing facilities, transportation and communications systems, and services throughout our economy. Although coal’s total contribution to the American economy and way of life is impossible to estimate, coal production has demonstrable benefits. These include the direct employment of nearly 150,000 people and the creation of 3.3 jobs for every job in coal mining, for a total of more than 500,000 jobs. Coal generated $26 billion in sales and paid $13 billion in direct wages and salaries according to 2016 analysis by the National Mining Association. Coal fueled electricity generation is a major creator of much-needed jobs in America’s economy. Because of its abundance, reliability and affordability, about one-third of the nation’s electricity is generated from coal, resulting in electricity costs that generally are 30 percent lower in states that rely upon coal for more than half of their electricity generation versus states that rely on other fuels. 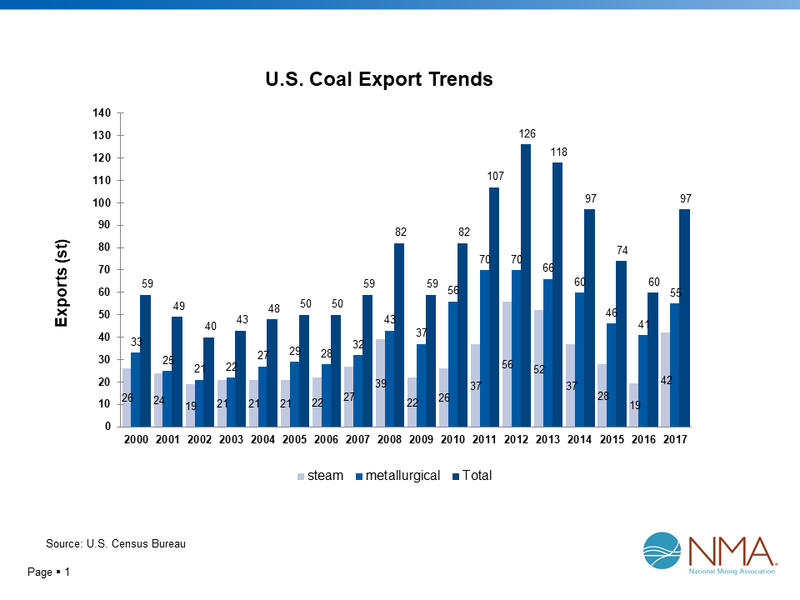 The economic contribution of coal exports extends well beyond the activities conducted at mine sites and includes employment related to downstream transportation providers that move coal from mines to ports, as well as the port services that prepare and load the coal for shipment abroad, and other businesses that are supported by coal export activity. Each step in this process contributes economic activity to the U.S. economy. The average person in the U.S. uses nearly 40,000 pounds of newly mined minerals — including three tons of coal – each year. Every million tons of coal exported supports 1,320 direct, indirect, and induced jobs in the economy. These coal-export related jobs (at coal mines, transportation companies, port and port services, and coal-exporting ships) earn an annual average family-wage of over $90,000.